One of my dev machines has long had a weird anomaly where file operations in Explorer that should prompt for UAC, such as copying a file into C:\Program Files, would instead silently fail. This led to all sorts of issues, from being unable to delete certain files — they’d just obstinately sit there, no matter how much I pressed that Del key — to trying to move folders containing a hidden Thumbs.db file and being unable to move the folder. My UAC settings were the Windows defaults. Nothing weird these. So I’d always treated put this issue into my “too busy to solve this now” basket. The classic basket case. But today I finally got fed up. After a quick search for the symptoms on Dr Google returned no results of significance, I decided I needed to trace the cause myself. It was time to pull out Process Monitor out of my toolbox again! Process Monitor is a tool from the SysInternals Suite by Microsoft that monitors and logs details on a bunch of different operations on your computer. I use Process Monitor, Procmon for short, all the time to solve problems big and little. But for some reason, it hadn’t crossed my mind until today that I could apply Procmon to this problem. 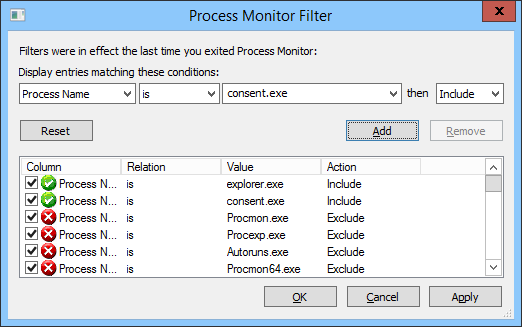 First, I configured Procmon to filter all events except for those generated by Explorer.exe and Consent.exe. I wasn’t sure if Consent.exe was involved in the problem (Consent.exe being the UAC elevation prompter), but it wouldn’t hurt to include it to start with. Note that all those Exclude filters are default filters setup by Procmon to exclude itself and its friends, removing that confusion from the logs. Then I went ahead and tried to copy a file into C:\Program Files (x86). It was just an innocent little text file, but Explorer of course acted like a Buckingham Palace Guard and silently and stolidly ignored its existence. I used the clipboard Ctrl+C and Ctrl+V to copy and paste (or attempt to paste) the file. I didn’t think the clipboard was at fault because all other UAC-required file operations also failed silently. I could have dragged and dropped, it would have had the same effect. But now, with procmon, I had captured the communication that went on behind the scenes. All those secret coded winks and nose scratches that told Explorer to fob off any attempts to trigger a UAC prompt. Here’s what I was presented with in the Procmon log. I searched for the name of my text file (test.txt), and used Procmon’s Highlight tool to highlight every reference to it in the Path column. This made it easy to spot nearby interactions that may have been related, even if they didn’t directly reference the test.txt file itself. You can see below two of the highlighted test.txt lines. Because there was a lot going on, I filtered out a lot of Operations that I thought were not relevant, such as CloseFile, RegCloseKey, RegQueryKey, ReadFile and WriteFile, among others. This reduced the log considerably and made it easier to spot differences (my screen capture below shows the filtering after it was reset, however — I forgot to capture the filtered trace, sorry). That was the only visible difference of significance in the logs. Now for those of you who just knee-jerked into “why on earth are you using CVS?! ?”, calm down! This is a story, and I’m telling the story. 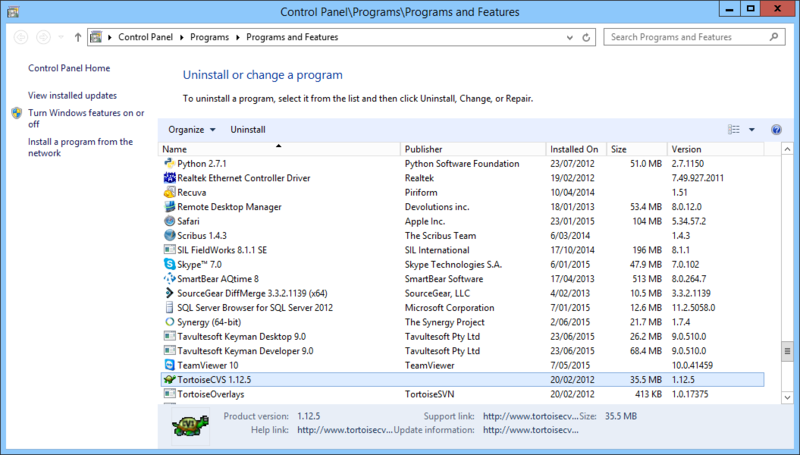 I decided that I didn’t really need TortoiseCVS installed and decided to try uninstalling it. Sadly, uninstalling it required a reboot, no doubt to remove its old fashioned hooks into Explorer. After the reboot, I tried to copy my innocent little text file again. Success! I was now presented with the prompt I wanted! 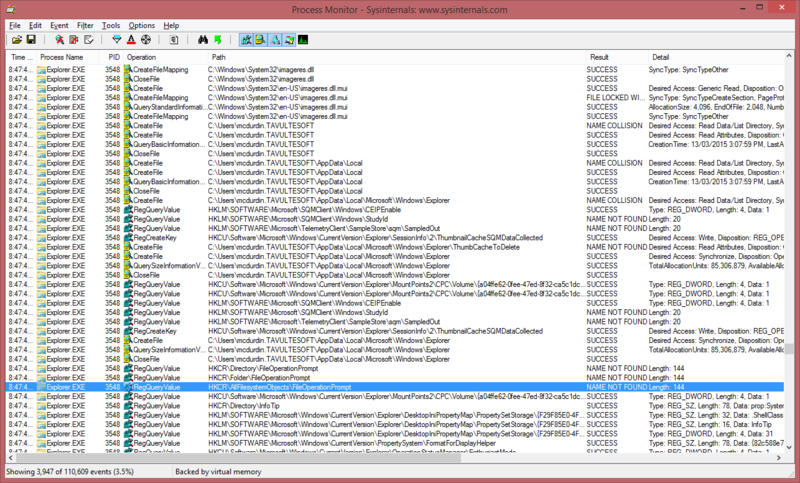 Another case closed thanks to SysInternals Suite and Mark Russinovich! This result passed directly to another arbitrary function. When these conditions are met (see code below for examples), the compiler generates code that crashes. The following program is enough to reproduce the bug. Upgrade to Delphi XE7 – this problem appears to be resolved, though I could not find a QC or RSP report relating to the bug when I searched. Moving to XE7 is not an option for us in the short term: too many code changes, too many unknowns. Don’t use properties in records. This means changing code to call functions instead: no big deal for the Get, but annoying for the Set half of the function pair. Patch around the problem by modifying UStrCat to return the address of the Dest parameter. In the end, I wrote option (3) but we went with option (2) in our code base. Because UStrCat is implemented in System.pas, it’s difficult to build your own version of the unit. One way to skin the option 3 UStrCat is to copy the implementation of UStrCat and its dependencies (a bunch of memory and string manipulation functions), and monkeypatch at runtime. In UStrCat, Add push eax just after the conditional jump to UStrAsg, and pop eax just before the ret instruction. 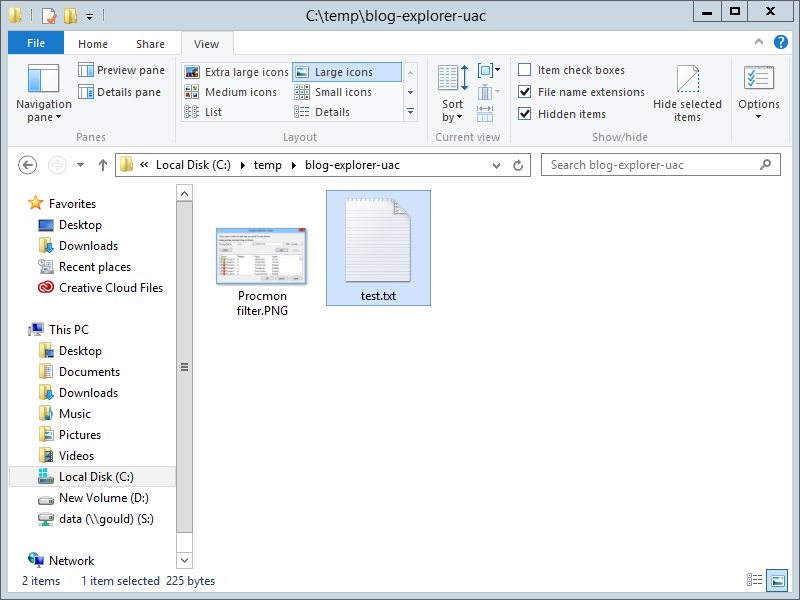 In UStrAsg, wrap the call to FreeMem with a push eax and pop eax. // First write the long jmp instruction. This solution does give me the heebie jeebies, because we are patching the symptoms of the problem as we’ve seen them arise, without being able to either understand or address the root cause within the compiler. It’s not really possible to guarantee that there won’t be some other code path that causes this solution to come unstuck without really digging deep into the compiler’s code generation. As noted, this problem appears to be resolved in Delphi XE5 or possibly earlier; however it is unclear if the root cause of the problem has been addressed, or we just got lucky. The issue has been reported as RSP-10255. 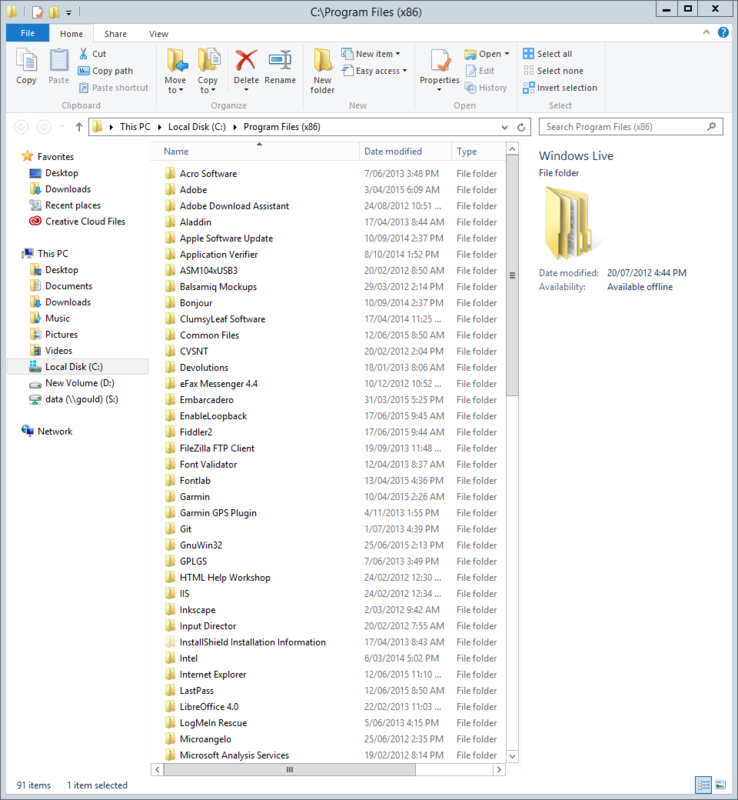 Fifty-nine vulnerabilities, or do you feel safe using Windows XP? In today’s Microsoft Security Bulletin release was a very long list of vulnerabilities fixed in Internet Explorer. A very long list. 59 separate vulnerabilities to be exact. I do believe that is a record. But I’m not here to talk about the record — I am more interested in the steps Windows XP users will take to mitigate the flaws, because Microsoft are not patching any of these vulnerabilities for Windows XP! Some people I’ve talked to, from individuals up to enterprises, seem to have the idea that they’ll practice “Safe Computing” and be able to continue using Windows XP and avoid paying for an upgrade. What do I mean by Safe Computing? Y’know, don’t open strange attachments, use an alternate web browser, view emails with images switched off, keep antivirus and malware protection software up to date, remove unused applications, disable unwanted features, firewalls, mail and web proxies, so on and so forth. So let’s look at what the repercussions are of practicing Safe Computing in light of these disclosures. 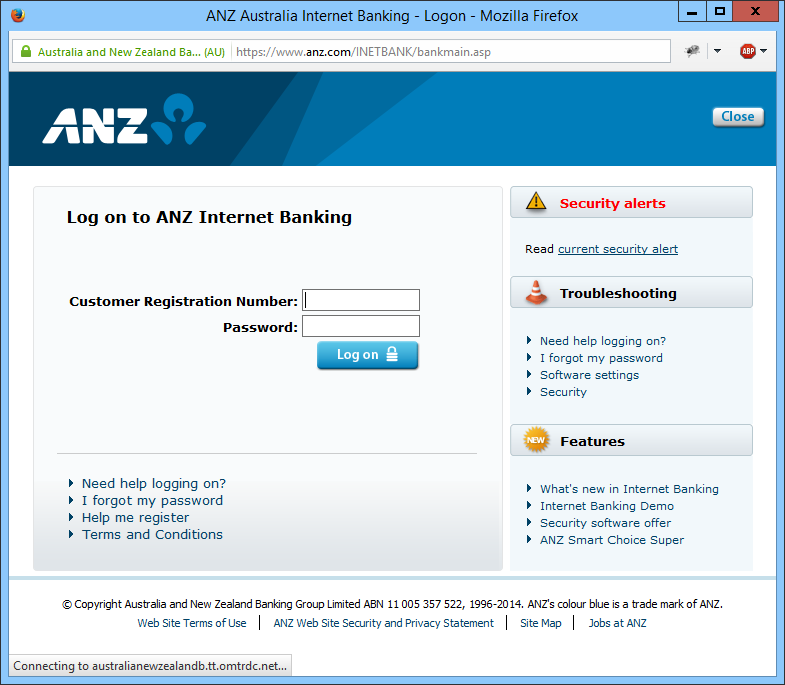 The first mitigation you are going to take is, obviously, to stop using Internet Explorer. With this many holes, you are clearly not going to be able to use Internet Explorer at all. This means a loss of functionality, though: those Internet Explorer-optimised sites (I’m looking at you, just about every corporate intranet) often don’t even work with non-IE browsers. 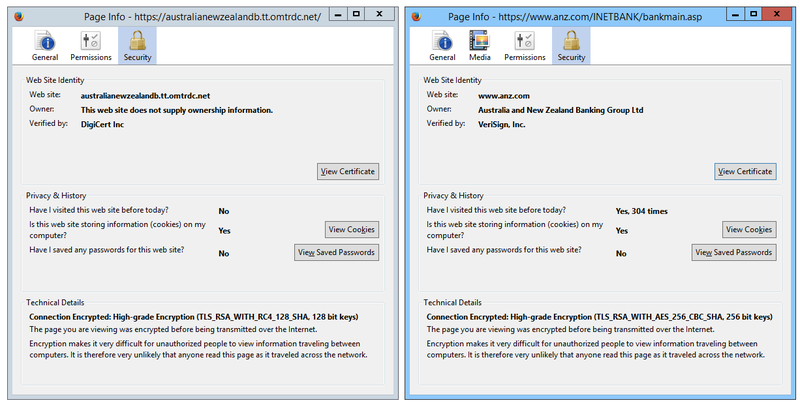 So if you have to use IE to view these ‘trusted’ sites, you must ensure you never click on an external link, or you will be exposed again. Doable, but certainly a hassle. Okay, so you don’t use IE now. You use Firefox, or Chrome. 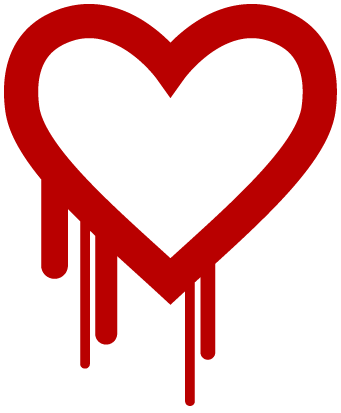 But you’re still in trouble, because it turns out that the very next security bulletin announces that GDI+ and Uniscribe are both vulnerable as well, today. 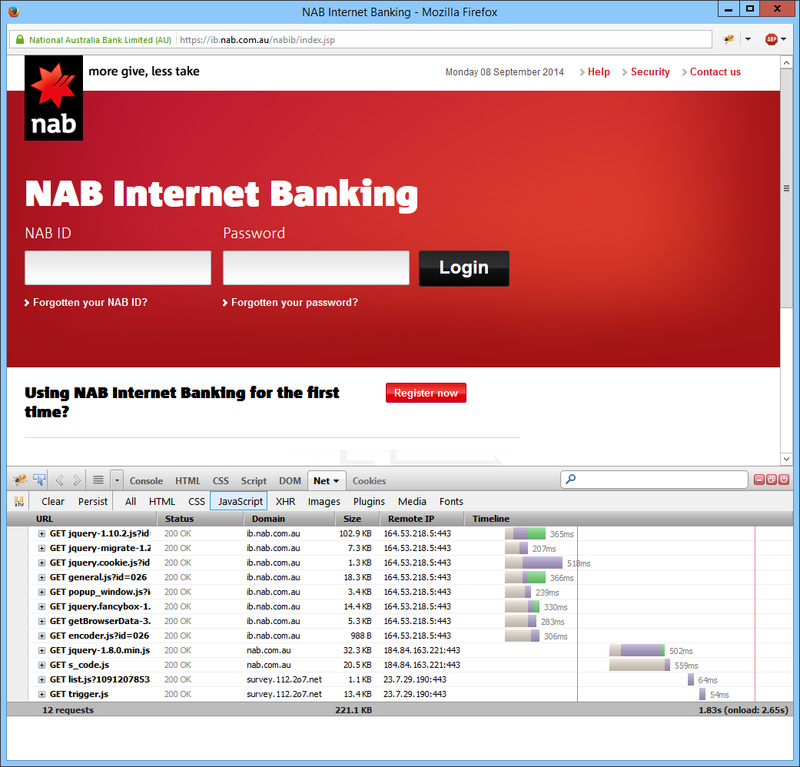 GDI+ is used to display images and render graphics in Windows, and Uniscribe is used by just about every application to draw text onto the screen, including all the major web browsers. The Uniscribe flaw relates to how it processes fonts. The GDI+ flaw relates to a specific metafile image format. So, disable support for downloadable fonts in your browser, and disable those specific metafile image types in the Windows Registry. Yes, it can be done. Now you’ll be all good, right? You don’t need those fonts, or those rare image types, do you? You can still surf the web okay? But you’ve lost functionality, which we might not value all that highly, but it’s still a trade-off you’ve had to make. From today, every security flaw that is announced will force you to trade more functionality for security. And this is my point. From today, and on into the future, every security flaw that is announced will force you to trade yet more functionality for security. Eventually, you will only be able to use Windows XP offline — it simply will not be possible to safely access Internet resources without your computer and your data being compromised. It’s going to get worse from here, folks. It is well and truly past time to upgrade. Only 21? Do you feel safe yet? 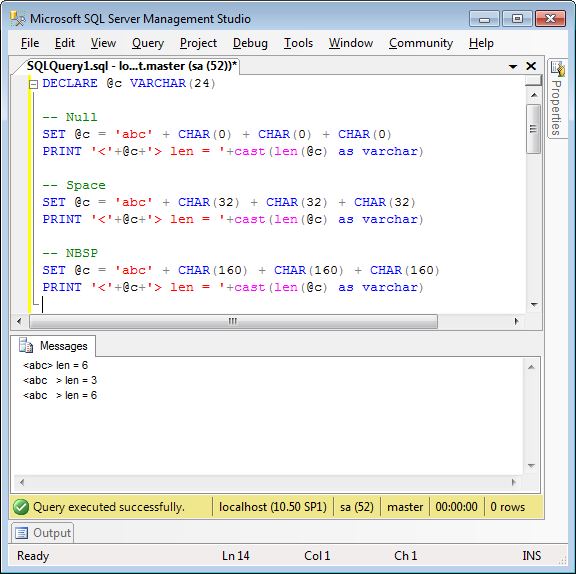 We tripped over recently on our understanding of Microsoft SQL Server’s T-SQL LEN function. The following conversation encapsulates in a nutshell what any sensible developer would assume about the function. Now, I wouldn’t be writing this blog post if that was the whole story. Because, like so many of these things, it’s not quite that simple. Originally, we were using RIGHT(string, LEN(string) – 2) to trim two characters off the front of our string. Or something like that. Perfectly legitimate and reasonable, one would think. But we were getting strange results, trimming more characters than we expected. It turns out that T-SQL’s LEN function does not return the length of the string. It returns the length of the string, excluding trailing blanks. That is, excluding U+0020, 0x20, 32, ‘ ‘, or whatever you want to call it. But not tabs, new lines, zero width spaces, breaking or otherwise, or any other Unicode space category characters. Just that one character. This no doubt comes from the history of the CHAR(n) type, where fields were always padded out to n characters with spaces. But today, this is not a helpful feature. But here’s where it gets really fun. Because a post about strings is never complete until you’ve done it in Unicode. Some pundits suggest using DATALENGTH to get the actual length of the string. This returns the length in bytes, not characters (remember that NCHAR is UTF-16, so 2 bytes per character… sorta!). Starting with SQL Server 2012, UTF-16 supplementary pairs can be treated as a single character, with the _SC collations, so you can’t even use DATALENGTH*2 to get the real length of the string! 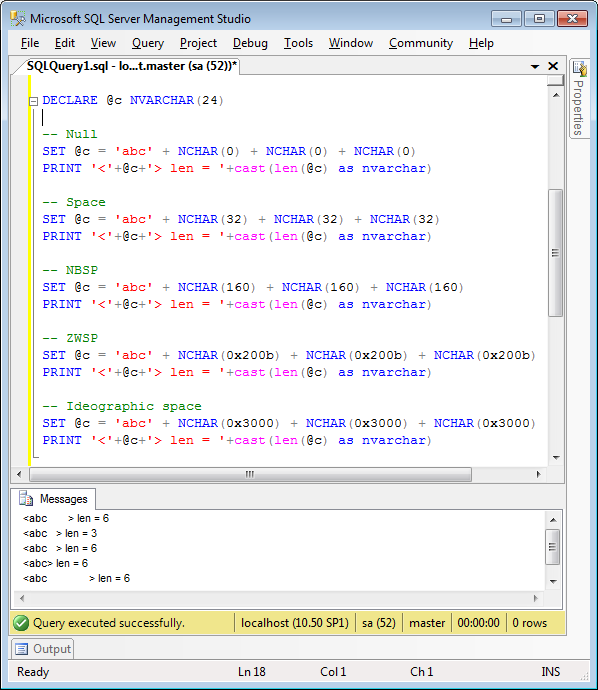 Just to really do your head in, let’s see what happens when you use LEN with a bunch of garden variety SQL strings. I should warn you that this is a display artefact involving the decidedly unrecommended use of NUL characters, and no more, but the weird side effects are too fun to ignore. Now here’s where things go really weird. 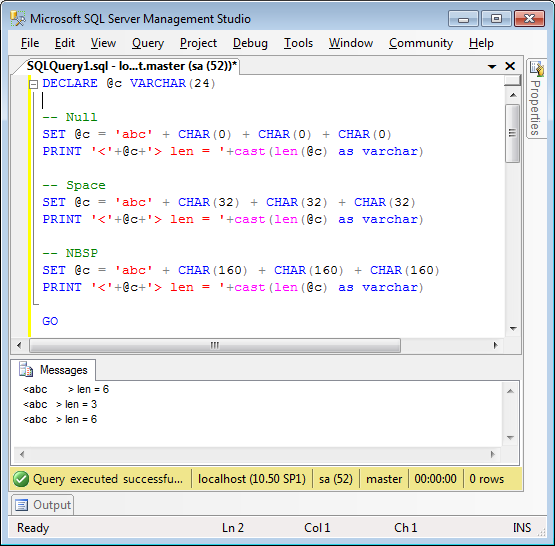 Running in Microsoft’s SQL Server Management Studio, I switch back to the first window, and, I must emphasise, without running any queries, or making any changes to settings, take a look at how the Messages tab appears now! That’s right, the first line in the messages has magically changed! The only thing I can surmise is that switching one window into Unicode output has affected the whole program’s treatment of NUL characters. Let that be a warning to you (and I haven’t even mentioned consuming said NULs in C programs).